DaVita Inc., a leading provider of kidney care services, was recently recognized by FORTUNE Magazine as one of the top health care facilities in the country. DaVita ranked #1 in the field of Health Care Medical Facilities for innovation, Long-Term Investment and Quality of Products and Services. Overall, the company ranked 2nd in the Health Care Medical Facilities category and remains the only kidney care company to make FORTUNE Magazine's World's Most Admired Companies for list 2009. 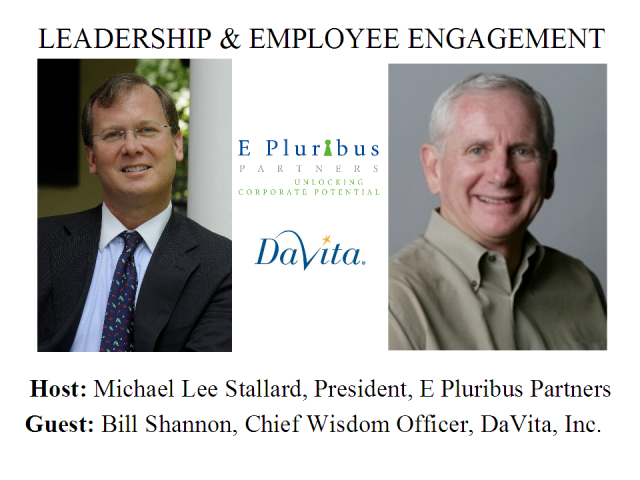 In this webcast, we will learn about DaVita's remarkable corporate culture from Bill Shannon, DaVita's Chief Wisdom Officer. Rich Armstrong, president of The Great Game of Business, will be Michael's guest to discuss a best practice called Open-Book Management. Rich's company helps organizations employ a form of Open-Book Management that positions the business of an organization as a game with teams, scorekeeping and so forth. You'll learn about the power of Open-Book Management and how to successfully implement it in this webcast. Join host Michael Lee Stallard and his guest Polly Pearson, VP of Employment Brand and Strategy Engagement at EMC Corporation. Polly's employment branding work has been featured on CBS News, National Public Radio, the Financial Times and in many other media. Join me with my guest Howard Behar, former president of Starbucks International. We will discuss the Starbucks culture and particularly what elements and best practices made Starbucks so successful. Join me and my guest Robert Curry, Founder of Turning Point for Leaders, a New Canaan, CT-based coaching and consulting firm that provides substance abuse treatment to senior executives and professionals. During the webcast Robert and I will discuss what leads to substance abuse among executives and how to to overcome the addiction. Robert is one of the leading authorities in this field who has been trained at the Betty Ford institute, The Meadows, the Relational Life Institute,The Westchester Institute for Training in Psychoanalysis and Psychotherapy, the Institute for Rational-Emotive Therapy and Tavistock Institute for Group Relations. Mario Sundar, Community Evangelist at LinkedIn, will discuss the various ways you can connect on LinkedIn to advance your career, your knowledge and your network. Mario Sundar has over 5 years experience in marketing leadership, managing projects for Fortune 50 companies. As LinkedIn's Community Evangelist he’s responsible for their social media efforts – ranging from the blogosphere to community outreach. Dr. Kent Keith, CEO of the Greenleaf Center for Servant Leadership will talk about Robert Greenleaf and his concept of the Servant Leader. Steve Denning is an expert in organizational storytelling. He is the author of "The Leaders Guide to Storytelling" and "The Secret Language of Leadership." In this webcast Steve will explain why organizational storytelling is essential to performance and the best practices of organizational storytelling. Join host Michael Lee Stallard and his guest Rick Garlick, Senior Director of Consulting and Strategic Implementation at Maritz Research, to learn about the results of Maritz' research on how corporate values affect organizational performance. Michael Lee Stallard with John Timmerman, Corp. VP, Ritz-Carlton Hotel Co.
John Timmerman, Corporate Vice President, Operations, The Ritz-Carlton Hotel Company, L.L.C. will be my guest. On the webcast we will discuss Ritz-Carlton's culture and how it engages employees and guests. During the webcast John will share his thoughts on the Ritz-Carlton's best practices such as its employee selection process, the employee promise, the Ritz-Carlton Basics, the Daily Line Up, etc. Kim Cameron is a Professor of Management and Organization at the University of Michigan's Steven M. Ross School of Business. He is one of the core faculty members of the Center for Positive Organizational Scholarship. In this webcast professor Cameron will tell us about the work and findings of the center including the link between virtuous organizations and organizational performance. New technologies are facilitating connections among an organization's employees, customers and suppliers. Join me and my guest Charles Bess, an EDS Fellow, as we discuss the profound effect technology has and will continue to have on organizations. Charles has been Chief Technologist for the EDS relationship with some of America's leading companies. The position of EDS Fellow is awarded to the most innovative thought leaders in recognition of their exceptional achievements. Michael Lee Stallard with Tim Sanders, author of "Saving the World at Work"
Author Tim Sanders will join host Michael Lee Stallard do discuss Tim's new book entitled "Saving the World at Work." Please join me as I host a webcast with Charles W. "Willy" Moore Jr. on January 14, at 11:00 AM Eastern. When I spoke to a group of leaders at Lockheed Martin last year I heard Willy share his thoughts on leadership. He impressed me with his wisdom and extensive experience as a Vice President responsible for a major group at Lockheed and as a Vice Admiral during a distinguished 36-year career in the United States Navy. During his Navy career, Vice Admiral Moore served as a Deputy Chief of Naval Operations, Fleet Readiness and Logistics, Commander, U.S. Naval Forces Central Command and Commander, U.S. Fifth Fleet (1998-2002). In this role VADM Moore commanded all U.S. Naval Forces throughout the Middle East and the Horn of Africa during a time of nearly constant combat. VADM Moore led his forces in combat operations including Infinite Reach after the 1998 Embassy bombings in Kenya and Tanzania, Operation Desert Fox in Iraq and subsequent combat in the no-fly zone, Operation Southern Watch, Operation Determined Response after the terrorist bombing of USS Cole and Operation Enduring Freedom in Afghanistan fighting the global war on terrorism. Kevin Eikenberry is a highly respected leadership speaker and trainer whose written an outstanding book entitled "Remarkable Leadership." In this webcast Kevin will describe Remarkable Leaders with particular focus on how they connect with the people they lead. Join Michael Lee Stallard and his guest Larry Ackerman, founder and president of The Identity Circle. Larry is a leading authority on organizational and identity. In a professional career spanning more than 25 years, Mr. Ackerman has helped meet some of the most complex challenges facing large organizations struggling to distinguish themselves in their fields. As a personal coach to senior executives, as well as consultant to their institutions, his insights have helped many leaders discover the keys not just to survive, but to flourish. Larry’s consulting experience is international and multi-industry in scope. He has directed assignments for such diverse companies as AARP, Aetna, The American Academy of Family Physicians, Baxter Healthcare, Boise Cascade, Dow Chemical, EDS, Fidelity Investments, Gates Corp, Interbrew, Lockheed Martin, Maytag, National Australia Bank, Norsk Hydro, State Farm Insurance, Ernst & Young, and Westinghouse. Larry has published two ground-breaking books on identity. In his first book, Identity Is Destiny: Leadership and the Roots of Value Creation (Berrett-Koehler, 2000), the author set forth a revolutionary view of the nature of identity and its impact on leadership and management. In his second book, The Identity Code: The 8 Essential Questions for Finding Your Purpose and Place in the World (Random House, 2006), Larry asserts that we “cannot be anything we want to be;” but rather, that long term fulfillment comes when we live by the ‘identity code’ that defines our unique value-creating potential. Larry Ackerman has been a guest lecturer at the Yale School of Management, Wharton, Pepperdine University and UCLA’s Anderson School. Larry is a top-rated speaker for The Conference Board, and a regular keynote speaker for senior management meetings among global companies. In this webcast, Mr. Ackerman will share many of his insights about how and individual can unlock the power of his or her identity. Join host Michel Lee Stallard with his guest Marc Effron, the dynamic vice president of talent management at Avon and head of the New Talent Management Network. Marc is a thought and practice leader in talent management who is challenging industry practices when it comes to developing talent. Tune in to learn more about how Marc and his team have transformed Avon into one of the leading talent engines worldwide. In this webcast, Mr. Ackerman will share many of his insights about how organizations can unlock the power of identity. Michael Lee Stallard with Guest Paul Spiegelman of Breyl Cos.
Join host Michael Lee Stallard and his guest Paul Spiegelman, CEO of Beryl Companies. Beryl is the leading provider of call center outsourcing services for hospitals. It has achieved record levels of employee retention by creating and maintaining an extraordinary culture where employees thrive. Tune in to this webcast to learn Beryl's secret sauce that keeps this hot company cookin! Join Michael Lee Stallard, author of the best-selling book "Fired Up or Burned Out" and president of the consulting firm E Pluribus Partners, as he speaks or interviews guests about leadership and employee engagement. Michael has been the author of articles or quoted in leading publications including The Wall Street Journal, The New York Times, Leadership Excellence, Leader to Leader, Chief Learning Officer, The Economic Times, Shukan Diayamondo and Capital. His is frequent speaker including at events for Fortune Magazine, the Corporate Executive Board, and the World Presidents Organization. Michael is a guest lecturer at the University of Virginia's Darden Business School and New York University's Stern School of Business.